Two Bassmaster pros you’ll find flipping, pitching or punching heavy cover more often than not are Ott DeFoe and Randall Tharp. But why? Glad you asked! We wondered too, so we interviewed them this week. Based on DeFoe and Tharp’s comments, we compiled the following list of 6 Reasons to Fish Heavy Cover. 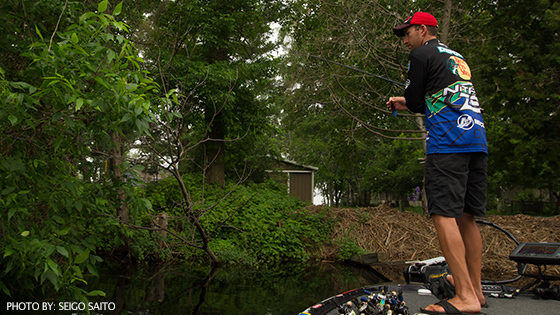 In all these scenarios, your best bet for keeping bass buttoned up is a VMC® Heavy Duty hook. VMC’s straight-shank Heavy Duty Flippin’ Hook features a double-spiked baitholder with opposing barbs that lock on softbaits. They also incorporate resin-closed eyes that prevent line slip. A strategically placed keeper system exposes a 1/8-inch area between the eye and holder, allowing anglers to tie the perfect snell. The Heavy Duty Flippin’ Hook comes in three sizes: 3/0, 4/0 and 5/0. VMC’s Heavy Duty Wide Gap hook features an offset behind the eye that arches away, then back toward the hook bend, making it ideal for larger softbaits. A three-degree twist in the hook body provides instant and hassle-free hooksets. The Heavy Duty Wide Gap hook comes in three sizes: 2/0, 3/0, 4/0, 5/0, 6/0, 7/0 and 8/0. Why? The biggest, baddest bass lay claim to the best ambush spots. Any bright, sunny day will “always be a better day for heavy cover than a day that has slightly overcast skies all the way to dark and gloomy,” DeFoe says. Why? “Because bass don’t have eyelids,” he explains. Unlike us, they have few options when the sun’s in their eyes. Sometimes it pays to zig when everyone else zags. In the summer, DeFoe says, “everybody wants to be out fishing deep.” But he too will often target shallow, heavy cover when much of the competition is playing bumper boats offshore. “We’re getting to that time of year that you can lay off those fish that are pressured, that everyone else is messing with, and go and do your own thing,” he says. On one such occasion, DeFoe placed 5th in a June Bassmaster Elite Series tournament on Alabama’s Lake Wheeler. The finish earned him his first Bassmaster Classic berth and his Rookie of the Year award. The best thing about shallow, heavy cover is “that it’s all visual,” DeFoe explains. “You don’t have to have the greatest, newest electronics.” Even where DeFoe lives in East Tennessee, “where fish are known for living really deep in the summer time,” he says, “there’s always fish shallow somewhere. Don’t have the time or patience to graph for offshore schools and then camp on them for hours, trying to cast at just the right angle to get one to bite? Set your trolling motor on high and flip a bunch of shallow, heavy cover. DeFoe will generally make about three flips to high-percentage fish-holding cover like wood and dock posts, but will take a few more stabs in heavy grass. Targeting the thick stuff with the right tackle will increase your speed and efficiency, Tharp says. “I might make 25 flips a minute with a tungsten weight and a 4/0 VMC straight-shank hook and soft-plastic, and it might only be 15 flips with a jig,” he explains. “Because I’d always be cleaning off the jig, or it would take me longer to get it in and out of the cover. Flipping and pitching shallow grass and punching vegetation mats are Tharp’s strong suits — and among his favorite ways to fish. So the Alabama transplant is in heaven in his new home state of Florida. This entry was posted in Pro Staff, Rapala, Tips, VMC and tagged Heavy Duty Flippin’ Hook, Heavy Duty Wide Gap, Ott DeFoe, Randall Tharp, straight-shank hook, VMC. Bookmark the permalink.